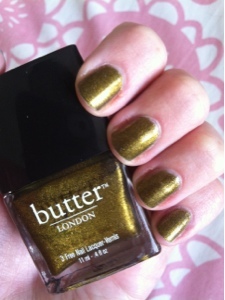 I have a new favorite nail polish color and it is Butter London's Wallis. I have had this color for ages and finally used it for the first time the other day. It is gorgeous! Green is kind of my go-to polish color. I really gravitate towards them, I have a million, but this one is extra special. It is kin of a moldy green but it is awesome. It is a mix of light green, dark green, and gold. LOVE IT! !